Two partially secret court hearings involving Northern Ireland informers are due to take place in London and Belfast this week, as the government deploys fresh legal powers. The applications for closed material procedures (CMPs) appear designed to prevent details emerging about the controversial roles of Freddie Scappaticci, the west Belfast man alleged to be the military informer codenamed Stakeknife, who ran the IRA's internal security unit in the 1990s; and Martin McGartland, a former RUC agent who infiltrated the IRA. Lawyers allege the cloak of national security is being used to resist legitimate claims. The coincidence of restrictions being imposed on both historic intelligence cases suggests Whitehall departments and the Police Service of Northern Ireland (PSNI) are determined to exploit the controversial procedure in domestic as well as international cases. Earlier this year, the Northern Ireland Office indicated it would also apply for a secret hearing in a third case involving a former dissident republican who was reimprisoned after his release on licence was revoked without the full reason being given. CMPs allow the judge and one party to a civil dispute to see sensitive evidence but prevent claimants and the public from knowing precisely what is being alleged. They were introduced by the Justice and Security Act, which came into force late last year. Most of the arguments during the legislation's passage through parliament focused on operations of the intelligence services in Iraq and Afghanistan. The more commonly used public interest immunity (PII) certificates prevent evidence being used by either side in a court case. CMPs add a new legal weapon to the government's armoury, permitting intelligence to be introduced into a case but withheld in full from a claimant. Supporters, including the cabinet minister Ken Clarke, who ushered the act through parliament, argue it enables the government to resist ill-founded claims. Critics say courtroom battles are no longer fought on a level playing field. The Belfast case has been brought by Margaret Keeley – whose husband was the MI5 informer known by the pseudonym Kevin Fulton – against the Ministry of Defence, the PSNI and Scappaticci. She alleges she was wrongly arrested and falsely detained in 1994 to protect her husband. Her solicitor, Kevin Winters of KRW Law, Belfast, told the Guardian: "In order to proceed with her claim against the British government for the violation of her human rights, Mrs Keeley requires disclosure of documents relating to her arrest and interrogation and the collusive role of the state in this. "Both the MoD and PSNI have applied for such information only to be disclosed to the judge and a special advocate in a closed material hearing. This is a controversial procedure under the recent Justice and Security Act 2013, which means that Mrs Keeley will be excluded from the assessment of the material. "[We] oppose these applications for CMPs. This procedure is not applicable to historical intelligence material which is no longer live and was never intended for use in proceedings relating to the conflict-related cases. The procedure is an offence to the principle of open justice." Scappaticci rose through the republican movement to head its internal security unit or "headhunters". Their task was to unmask, interrogate and kill informers working inside the IRA. But at the same time as Scappaticci was overseeing the murder of state agents, he was providing RUC special branch and MI5 with high-grade intelligence on senior IRA figures and operations. At first he and Sinn Féin denied he was working as an informer but the republican leadership has since admitted Scappaticci was Stakeknife, although Scappaticci has always denied it. Nogah Ofer, of Bhatt Murphy solicitors, who represents McGartland, said: "The claim is only to do with resettlement. There's nothing in it that requires exploration of his work as an IRA informant. "It's purely that they failed to provide for psychiatric help for his injuries and failed to pay the disability benefits they had promised. He was shot by the IRA in 1999. There have been public statements by state bodies about him confirming his former role, including that he has given valuable service to the state. "He was named in the Bloody Sunday inquiry so the government cannot rely on saying they 'neither confirm nor deny' his role when it[The government] has already confirmed publicly that he has been an agent. There's no need for closed hearings. It's part of a pattern of creeping secrecy." 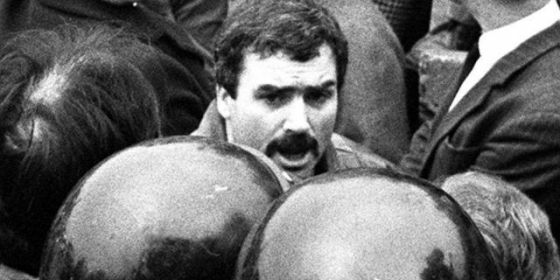 McGartland worked for the security services in Northern Ireland between 1987 and 1991 when his cover was blown. He was kidnapped by the IRA but managed to escape by jumping from a third-floor window. He was moved to north-east England but was tracked down after his address was released during a trial. He was shot seven times but survived and now suffers from post-traumatic stress.